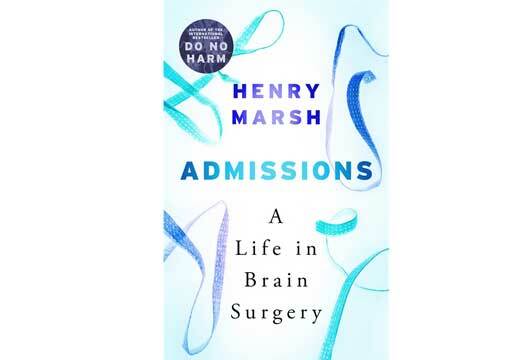 Rabeea Saleem reviews Admissions, the new memoir from neurosurgeon Henry Marsh. Admissions, Henry Marsh’s much-anticipated follow up to the remarkable Do No Harm, gives a glimpse of his life as he retires from NHS after a prolific and remarkable career as Britain’s leading neurosurgeon. It is immediately clear a few pages in that this memoir is markedly different from Do No Harm. The former featured challenging professional experiences, stratified according to neurological disorders. This one is part travel journal and part memoir, focusing on the surgeon’s reflections on his career and delving deeper into his childhood and personal life. While Marsh previously seemed reverential about the cutting edge technology in surgery and the marvels of science, here he seems a lot more jaded with the medical profession and how advancements in technology have taken the thrill out of surgery. At the very beginning of the book, he reveals that he resigned from the NHS in a fit of rage. This disgruntlement had been fostered over time by the increasingly steady loss of authority due to administrative red tape which has become the Achilles heel of NHS. The bulk of the book documents Marsh’s professional visits ito Nepal and Ukraine. Since he has worked extensively all over the world, he rationally scrutinises the glaring disparity between the health-care systems of struggling nations and the ‘First World’. He mourns the lack of medical expertise and the exorbitant costs of medical care in Nepal, where affordability trumps the availability of treatment. On the other hand, he also criticises extravagant, superfluous medical care. His acerbic narration of attending American workshops makes for amusing read. Marsh wryly recounts having the latest, ostentatious medical instruments dangled in front of him and being baffled at finding freeze-dried severed heads for trainee surgeons. He disapproves of this corporatisation which he calls the ‘peacocks tails of health-care’, indulged in cutthroat business building hospitals resembling shopping plazas. In this vein, he argues in favour of socialised health care which, despite its shortcomings, is a cut above the notoriously marketised American system. There are not many instances in which a memoir of a neurosurgeon could be called timely but Admissions makes pertinent points with regards to the current NHS crises of stagnating budgets and low morales among the GPs. Marsh’s repeatedly talks about his increasing frustration at the regulatory bureaucratic set-up of NHS where doctors are treated like an unimportant employee in a huge corporation. He mentions getting through the gauntlet of questionnaires and reams of assessment forms which are managed by private companies who ‘prey off the NHS like hyenas off an elderly and disabled elephant’. Through his experience, it is quite apparent how this system of exasperating paper shuffling and never-ending official procedures hampers not only the doctor’s efficiency but also his enthusiasm. Marsh noticeably stays away from regaling us with his surgical triumphs. He makes a divisive case for euthanasia while pondering how technology often does not alleviate pain, but instead only helps in deferring death. He muses at length about our mortality and human fallibility and emphasises that the quality of life of the patient should be a greater concern for surgeons rather than another feather to their cap from an operation. Admissions would have benefitted from the omission of some long-winded chapters detailing his post-retirement restoration of a cottage, but it’s a well-rounded memoir. Capturing Marsh’s apprehension as he makes the transition into retirement and old age, Admissions is an introspective read, giving us a glimpse of the insecurities and fears of a genius. Admissions by Henry Marsh is published by W&N; 4 May 2017. Read more from Henry Marsh in our archive.